Anna Eleanor Roosevelt, president of Goodwill Industries, addresses reporters and guests Wednesday, Feb. 8, 2012, during a sneak preview of the organization's new warehouse and Buy-the-Pound Outlet store in Gorham. Goods are piled onto blue tables for sale at Goodwill Industries of Northern New England's new Buy-the-Pound outlet store in Gorham during this Feb. 8, 2012, pre-opening event. At the new store, shoppers will be able to purchase clothing, accessories, houseware, toys, shoes, books, movies and music by weight. 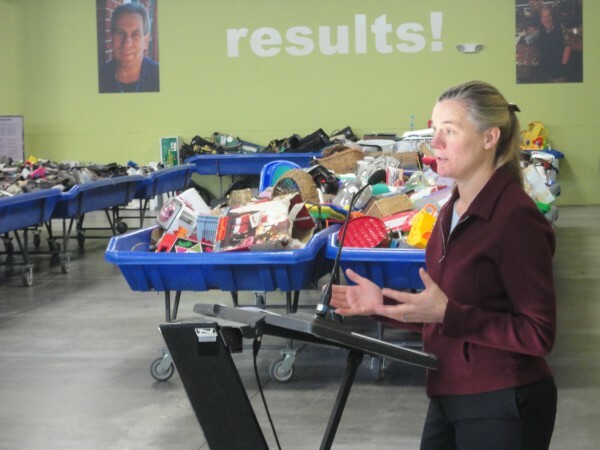 Merritt Carey, of Maine Businesses for Sustainability, lauds Goodwill Industries of Northern New England's new warehouse and outlet store for its reuse and recycling of goods during a Feb. 8, 2012, event at the Gorham location. 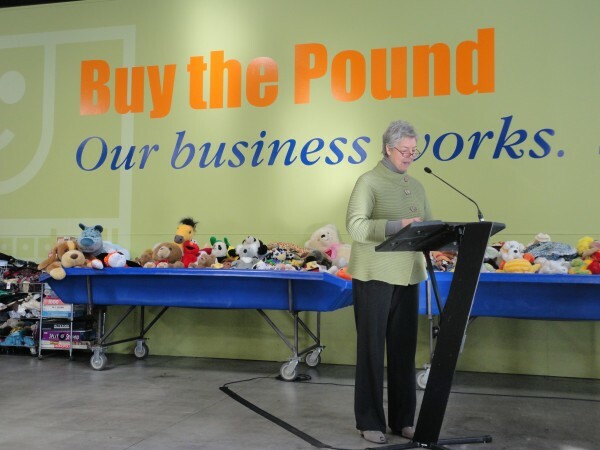 GORHAM, Maine — Goodwill Industries of Northern New England will soon open its new Buy-the-Pound outlet in Gorham. The store is like the island of misfit toys, the last stop for merchandise gathered from stores around northern New England. All the merchandise will be sold by the pound. A cart stuffed with 50 pounds of clothes, accessories, housewares, toys and shoes, at 79 cents per pound, say, would cost a shopper $39.50. The less you buy, though, the higher the per-pound prices. Those buying between a half pound and 10 pounds of used, donated and refurbished items will be charged $1.49 per pound, for instance. Movies and music? Records and CDs will cost $1 per pound and DVDs will cost $2 per pound. Paperback books will be 25 cents each pound, hardcovers will be double that, as will video and cassette tapes. Anna Eleanor Roosevelt, president of Goodwill Industries of Northern New England, said the uncommon pricing system — at least outside of fruit stands and butcher shops — is meant to give the goods one last chance at being bought before sorted for recycling. “It’s kind of catchy. We hope it’ll be a big success,” Roosevelt, granddaughter of former President Franklin Delano Roosevelt, told the Bangor Daily News Wednesday. The Buy-the-Pound outlet store is located in a walled-off 6,500-square-foot section of the organization’s new 106,000-square-foot warehouse in the Gorham Industrial Park, and it will sell products that went unsold at the 26 Goodwill retail stores in Maine, New Hampshire and Vermont. The outlet is scheduled to open to the public at 9 a.m. on Feb. 16. Roosevelt said she expects bargain hunters and resellers alike to frequent the store, and that the organization hopes to get revenue — even if just a little per pound — from goods that overstayed their welcome on retail sales floors and in the past were just junked in recycling bins. Behind the walls partitioning the outlet from the rest of the warehouse, groups of workers sort donations for distribution to northern New England retail stores, cut up old unsold articles of clothing to be sold as rags to car washes and kitchens and separate cardboard, plastic and other recyclable packages and office materials. The facility, which Goodwill moved into during the fall, dwarfs the organization’s previous 44,000-square-foot Diamond Street warehouse. 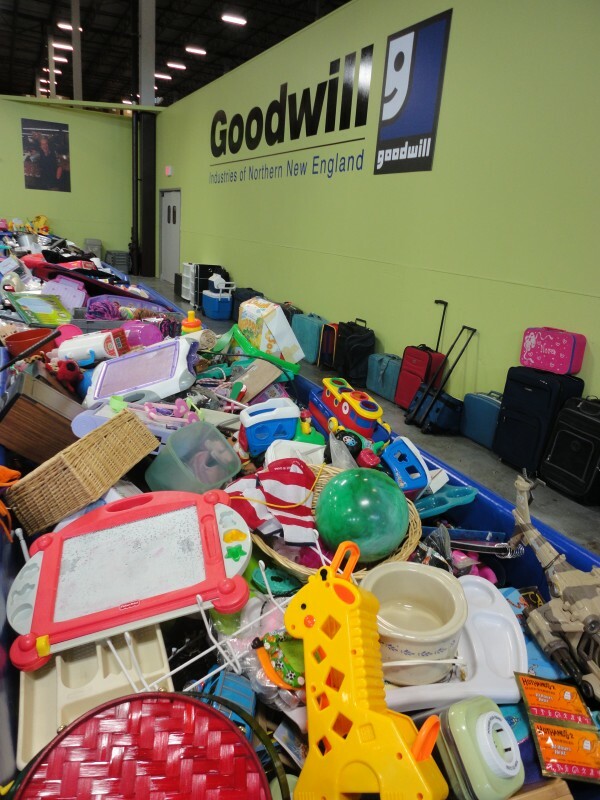 The extra space allows the group to consolidate and more accurately track inventory, said Goodwill Industries of Northern New England Operations Director Robert Frederick, as well as more thoroughly sort recyclable materials. “When I first saw this facility, I was amazed at how many ways this organization takes a single item and makes sure it’s used and used and used and doesn’t end up on the scrap heap,” Roosevelt said. The organization president said the group employs 1,800 people in Maine, New Hampshire and Vermont, with between 1,200 and 1,300 of those workers based in Maine. She said Goodwill prides itself on offering employees professional training that will help them move on to bigger and better things, and has positioned itself as a transitional employer for people looking to break back into the workplace.